Dulces Suenos translates as Sweet Dreams. Allow the sound of the waves and the song of the Coqui lure you to dreamland here in our oceanfront condo. Hola! Located in Luquillo, just 35 minutes from the airport in San Juan, this 3 bedroom 2 bath beach front condo has everything you need for a relaxing vacation. The condo is located in Playa Azul, a gated beachfront community, just steps away from Luquillo Beach. Enjoy the beautiful sunrise in the morning, swimming, snorkeling and boogie boarding in the afternoon and rum drinks on the balcony in the evening. You will have access to a full size pool (2/18/19 update is that the pools are still closed post-hurricane), playground equipment, basketball court, tennis court and a nicely stocked on-site library. 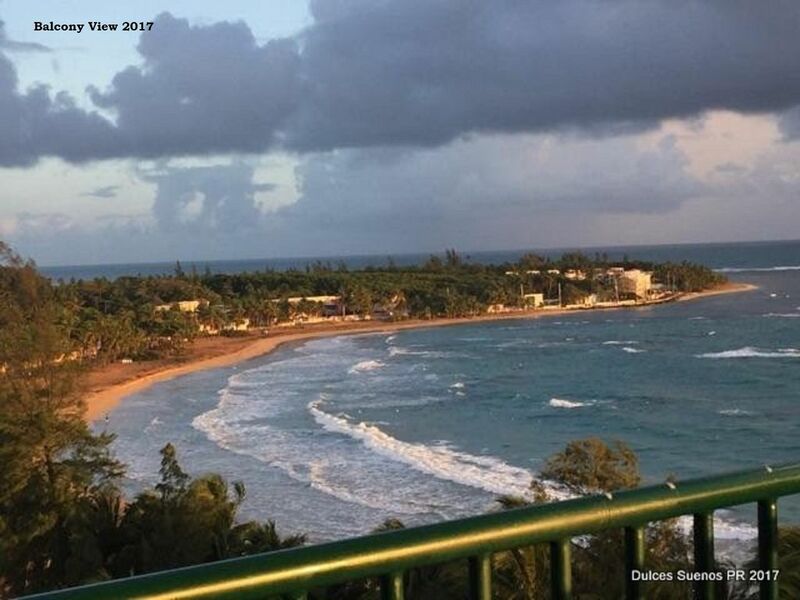 When you awake each morning head out to the 11th floor balcony to enjoy a cup of Puerto Rican coffee while watching the gorgeous sunrise and enjoying the soothing sound of the surf on the beach. You can also check in with the “real” world on your laptop with the free high speed WIFI available while watching the wave’s crash on the beach. The master bedroom boasts a king size bed and attached bathroom with a shower/tub combination. The second bedroom has a queen size bed and the third bedroom has both a queen and a twin bed. The second two rooms share a bathroom- also with a tub/shower. Six guests can be comfortable in this spacious condo. The unit is fully air conditioned with a ductless unit in the living area and window units in each bedroom. The living room and each bedroom also offer a ceiling fan if you prefer to keep the windows open and just let the salt air and soothing sounds of the beach lull you to sleep each night. We have a washer and dryer in the condo and also have beach towels, beach chairs and umbrella available. The condo is well located to enjoy the best of Puerto Rico. We are 20 minutes from El Yunque rainforest and the bio-bay in Fajardo and only 40 minutes from Old San Juan and the historic forts. The local area has several beaches in walking distance as well as restaurants and a grocery store. Come and enjoy this treasure in the Caribbean. Hello, I am a respiratory therapist for the local critical care transport team. Don is currently retired after 30 years of buying produce. The love of our life are our sweet little granddaughters. Their parents are pretty special too. The little ones keep us busy on our days off from work and we spend lots of time with them. We love to travel to warm tropical locations especially in the winter to escape the dreary Pacific Northwest weather. I read about the Bio-bays in Puerto Rico and wanted to visit the island so we arranged a vacation and when we arrived we fell in LOVE with the island and the local people. We previously had traveled to other locations and the locals were not terribly friendly but Puerto Rico was different. We spent our first day walking on Jobos Beach and we were approached by a local who recognized us as tourists (white skin turning red at amazingly fast rates probably was the give-way..LOL) and offered to show us the area while sharing information about both the local area and island in general. This was not an isolated incident, several times we were shown local sites by local people who are proud of their home and want to share it with others. Puerto Rico is nicknamed the 'Isle of Enchantment' and it truly enchanted both my husband and I. We are a few years from retirement and we decided to purchase a condo so when we are ready to retire we have it available but since we can only visit 2-3 times each year we thought why not rent it and let others enjoy the warm island of Puerto Rico. all bedding, bath and kitchen towels are provided. amenities include fridge with ice maker, stove and oven, washer/dryer. We had another wonderful vacation at Brandi's condo. The views from the balcony are amazing and the beach has something for everyone: soft sand, beautiful palm trees, shallow water with waves that are fun for stronger swimmers. The location is excellent with grocery stores, fast food, and other restaurants close at hand. Thanks again Brandi! I am so glad your family had a wonderful trip. Every visitor helps the recovery effort so thank you for coming back to visit this gorgeous island! Also thank you for choosing to stay with us. The condo is exactly as it appears online. It was very comfortable for my family and I. The condo was clean and fully equipped with everything we needed! There were beach chairs, snorkeling equipment, beach towels and board games. You are steps away from the beach and pool. The cool breeze on the balcony during the evenings was so refreshing. The gated community is secure and the property was very quiet. Brandi was very helpful prior to and during our trip. I would definitely stay here again on our next vacation to Puerto Rico! Definitely a 5 star rating!! This condo was perfect for our group. Ideal location for our day trips to El Yunque, San Juan, and snorkeling out of Fajardo. My elementary school kids loved the pool and the beach right there, and the quick drive over to Luquillo beach. Brandi could not have been more attentive or organized, and all the instructions were very clear for accessing and using the condo. Brandi was a LIFESAVER with her quick response and helpfulness when our flight plans changed due to airline issues. Amazing view from the balcony and rooms. Lots of beach gear in the closet. Nothing too fancy for my kids to break (perfect!). Everything was clean. Five star review for sure! We will be return customers in the future!! Thanks!! We had a wonderful time staying here for a week. The beach is gorgeous and not too crowded, and the condo had everything we could possibly need. Brandi was indispensable for helping us plan our trip. We were sad to leave but so happy to have had this once in a lifetime experience! Enjoyed our stay. Close to the beach, Walgreens, grocery store, ATM, restaurants, and the Kiosks!! The the security on the property, I felt safe. 7 days just wasn't long enough for me! Great condo and location. Awesome breeze at night, no need for A/C unless you have kids like us. We had a party of 4, with two toddlers. The condo had everything you might need, with guide books and detail recommendations. Great parking and security, loved the smart lock. Is our third time staying in the area and by far this condo is our favorite. Brandi was on point, great communication and detail instructions. Thank you Brandi! We'll be back again! PS: Thanks for the coffee! Thank you for the Awesome review! You are welcome to return anytime. Thank you so much for sharing your vacation with us. ~About 20 minutes to El Yunque rainforest. ~About 30 minutes to San Juan -- Old San Juan is well worth a visit. ~Isle Verde and Condado beaches are not nicer than the Playa Azul beach but the tourist crowds make it fun to visit for a day. ~Las Croabas / Fajardo boating area with night trips into the Laguna Grande Bio-Bay. The Bioluminescent bay of Fajardo is a short 10 minute drive from the condo and one of the most amazing natural phenomenons I have ever seen. ~A day trip from Las Croabas to Cayo Icacos is a wonderful beach / snorkeling visit -- the beach is magnificent with crystal clear water on this small coral island. Many group charters will take you there for around $80 per person. ~A ferry trip from Fajardo to Isla Culebra to see the magnificent Playa Flamenco (the ferry was $2 for a one hour trip -- the trip to Culebra can be rough (dramamine is usually available) but the return is usually gentle. There is much to do relatively close to the condo. All rates include cleaning fee of $90/ week. If you are booking more than 6 months prior to arrival please email me for other payment plan options.